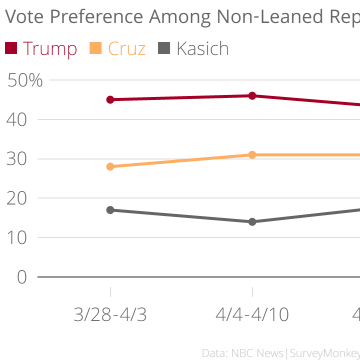 Donald Trump has reached 50 percent support from Republicans and Republican-leaners nationally for the first time since the beginning of the NBC News|SurveyMonkey Weekly Election Tracking Poll in late December. 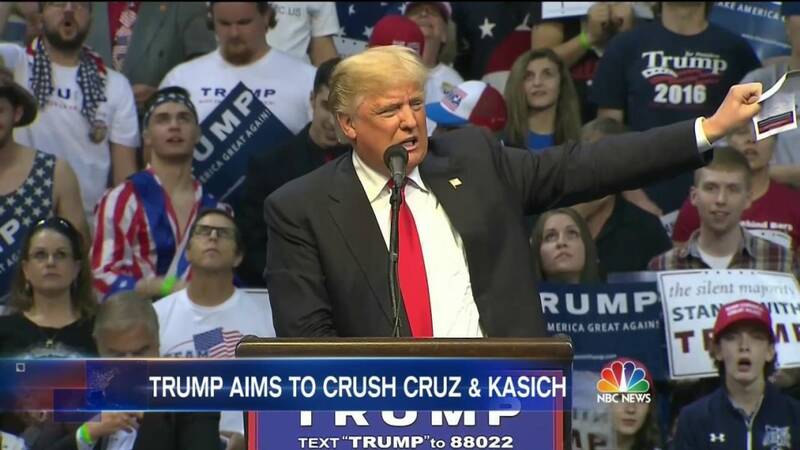 This milestone is significant as the 2016 primary heads into its final few weeks of contests, as there has been intense speculation that Trump’s support has a ceiling. 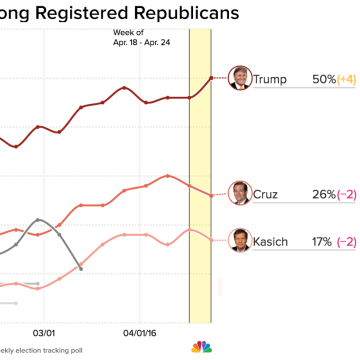 Though his support has hovered in the high 40s since mid-March, the front-runner had yet to secure half of Republican voters. These results are according to the latest NBC News|SurveyMonkey Weekly Election Tracking poll conducted online from April 18 to April 24 of 10,707 adults aged 18 and over, including 9,405 registered voters. Support for Trump among most demographic groups has remained consistent in this week’s tracking poll compared to previous weeks. However, when just looking at Republicans, excluding independents who lean toward the Republican Party, he now enjoys 49 percent support compared to 43 percent last week. This 6-point gain is important, as Trump usually does well among independents, but has struggled to win over more traditional Republicans so far. 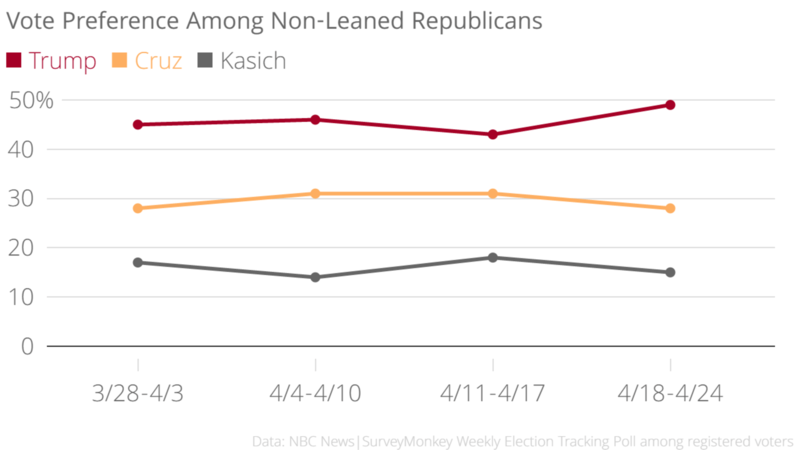 Support for both John Kasich (15 percent) and Ted Cruz (28 percent) is down among Republicans compared to the past few weeks. This traction among those who identify as belonging to the Republican Party will be significant as the Republican primary heads into closed primary races in Connecticut, Maryland, Pennsylvania and Delaware Tuesday. Rhode Island utilizes a hybrid primary in which only those who are registered as unaffiliated can vote in either party’s primary. 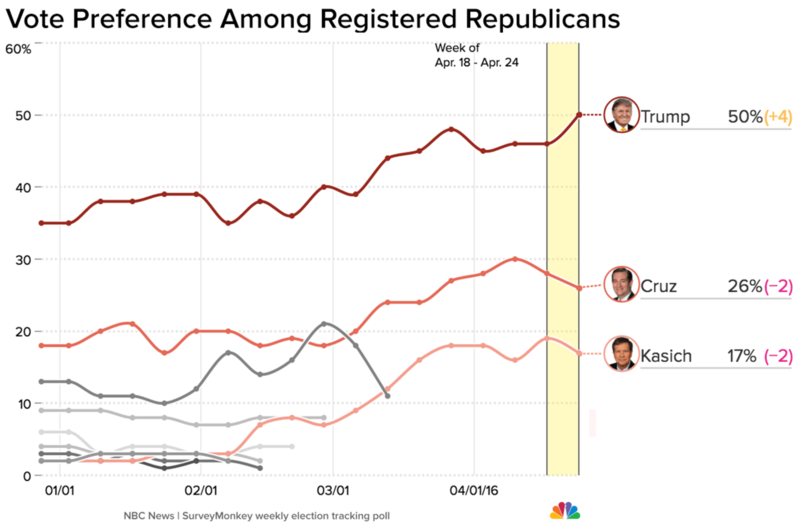 Overall, this week’s 6-point swing — Trump up 4 points, Cruz and Kasich down 2 points — is the biggest weekly shift in the poll so far. Combined with his significant win in New York, Trump’s rise nationally could be an early sign of consolidation within the Republican Party. The NBC News|SurveyMonkey Weekly Election Tracking poll was conducted online April 18 through April 24, 2016 among a national sample of 10,707 adults aged 18 and over, including 9,405 who say they are registered to vote. Respondents for this non-probability survey were selected from the nearly three million people who take surveys on the SurveyMonkey platform each day. Results have an error estimate of plus or minus 1.4 percentage points. For full results and methodology for this weekly tracking poll, please click here.